Orchos Yosher, the classic sefer by Rav Chaim Kanievsky shlita, is now available in a flowing English translation – together with more than 150 stories to enhance our understanding of the sefer's vital teachings. Rav Chaim presents 30 areas of our daily lives and illuminates them with teachings from our Sages, as well as his own wisdom and perspectives. The topics include Torah learning, chessed, honesty, humility, avoiding anger and pride, modesty, and many more. 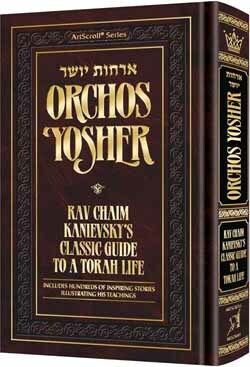 Rav Chaim's Orchos Yosher is studied and reviewed again and again by thousands. Now English readers can do the same - but this volume provides even more: a wealth of stories! The stories - about such legendary greats as the Chazon Ish, the Steipler, Rav Shach, Rav Steinman zt"l, and, of course, Rebbetzin Kanievsky a"h and ybl"ch Rav Chaim himself - show us how these teachings can be incorporated into today’s world, infusing our lives with authentic Torah values and perspectives. They were compiled by Rabbi Shai Graucher, who spend many hours with Rav Chaim and other members of the family. Every story was written and reviewed by the family for accuracy.